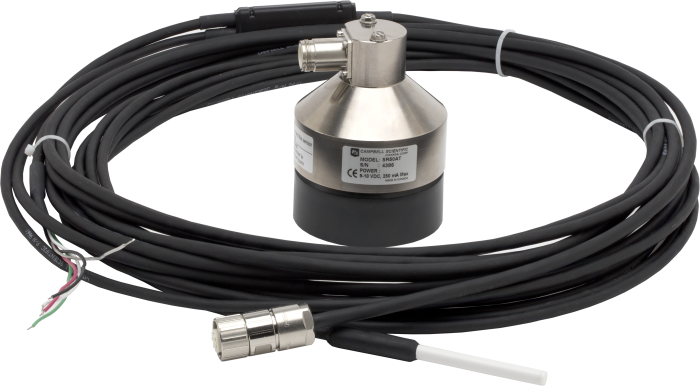 The SR50AT-L is an acoustic distance sensor that measures the elapsed time between emission and return of an ultrasonic pulse. This measurement can be used to determine snow or water depth. The SR50AT-L includes an external temperature sensor and outputs a temperature-corrected distance reading, eliminating the need for further post-processing. Note: Campbell Scientific recommends model SR50AT-316SS-L for marine environments. The SR50AT is an identical unit to the SR50A with the addition of an external temperature sensor. The temperature sensor requires a six-plate radiation shield. The SR50AT will output a temperature-corrected distance reading, eliminating the need for further post-processing, as well as a separate temperature reading. The SR50AT was designed to meet the stringent requirements of measuring snow depths and uses a multiple echo processing algorithm to help ensure measurement reliability. The SR50AT is compatible with all current Campbell Scientific data loggers, as well as many other data acquisition systems. An air temperature measurement is required to correct for variations of the speed of sound in air. Either the SR50AT or an existing on-site air temperature sensor can be used. The SR50AT is available with a heater option for locations where rime ice is a problem.